Frekhaug is the administrative centre of Meland municipality, located in Hordaland county, Norway. The village sits at the southern tip of the island of Holsnøy. 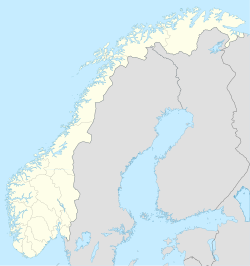 The 1.34-square-kilometre (330-acre) urban area of Frekhaug (which also encompasses the suburb of Vikane) has a population (2013) of 2,335; giving the village a population density of 1,743 inhabitants per square kilometre (4,510/sq mi). Frekhaug Manor (Frekhaug hovedgård) is a manor house and farm located on the southeast side of Holsnøy. The main house is a notched, two-story log house of painted white panel with a hipped roof. The building has a portal in rococo. The building was probably built in the 1780s and is surrounded by granite walls. In 1780, the farm was bought by skipper Cort Abrahamsen Holtermann (1730-1813). Since 1914, the manor house has been owned by the Nordhordland home mission (Nordhordland indremisjon). ^ "Frekhaug" (in Norwegian). yr.no. Retrieved 2014-04-15. ^ Store norske leksikon. "Frekhaug" (in Norwegian). Retrieved 2014-04-15. ^ Geir Thorsnæs. "Frekhaug". Store norske leksikon. Retrieved February 1, 2016. ^ "Kort om arbeidet". Nordhordland Indremisjon. Retrieved February 1, 2016. ^ Hopland, Endre (23 December 2005). "Trenar Løv-Ham". Avisa Nordhordland (in Norwegian). Retrieved 16 January 2009. This page was last edited on 3 August 2017, at 12:17 (UTC).